Items made from Acrylic scratch very easily and hence often look beaten up. This is especially annoying on acrylic components in water cooling systems as well as cars, bikes, caravans, boats, planes and furniture. But trim made from root wood in cars also scratches quickly. XERAPOL offers a surprisingly simple solution for this very common problem. 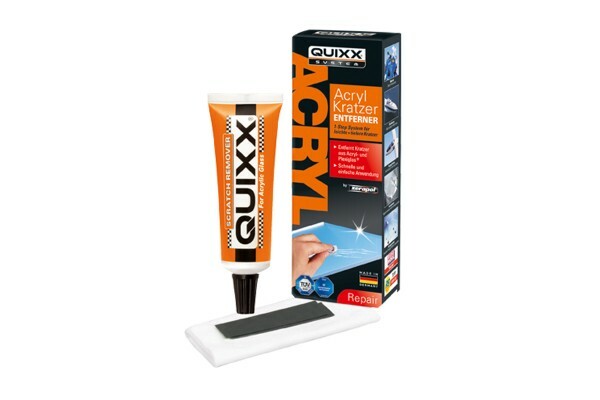 With a special polishing paste the user has the possibility to quickly and easily remove scratches on their own. The acrylic will afterwards shine like new! Clean the surface and apply some paste. Polish the scratched spot with a soft, clean cotton cloth or cotton wool pad for 2-3 minutes with strong pressure. Do not polish surfaces which have print, lacquer or surface coating on them. On deep scratches repeat multiple times. Remove residue with a cloth. Deep scratches should be sanded wet with special sandpaper (1600 grain). Polish with XERAPOL afterwards. The plastic is slightly dissolved on the surface and sanded with extremely fine sanding particles. The visible edges of the scratches are being rounded off and the base of the scratch is filled up. This makes surface smooth and shining again!